Acquiring an interest in a marital home in NJ depends on a number of factors. Many clients have posed the question: Do I have an interest in my marital home, even if my spouse owned it prior to the marriage? The short answer is, that depends on the facts of your case. Every case in matrimonial law, is very fact specific. A general answer to the question could change, or turn on one small fact. It is imperative that if you have any questions or concerns regarding your rights to an interest in a marital home, that you seek a full consultation, so that the particular circumstances of your matter can be properly analyzed. If the home is purchased within a reasonable period of time prior to the parties’ engagement or marriage, and they move into it together with the intention that it will be their marital home, it is a full marital asset, and completely subject to equitable distribution. Remember, it is equitable not equal. So if one party put down $50,000.00 from a premarital home, or gift from parents, etc. there is room to argue a disproportionate amount of division or credit owed back. The more time that passes between purchase and the divorce, the less weight premarital asset usage or gifts from parents will have. Gathering fact about these circumstances is crucial: did the parties both go with the realtor to look for houses? Did one spouse have a credit problem and that is the only reason they are not on the loan and deed? Etc. 2. Mortgage principal pay down. If marital earnings are used to pay the mortgage (regardless of who’s paying it—titled or untitled spouse) the untitled spouse will obtain an interest of 50% of the mortgage pay down. The untitled spouse does not get a dollar for dollar credit on mortgage payments, since there is a reasonable rental value to living somewhere and only actual equity is divisible. Capital Improvement made during the marriage with marital indebtedness or marital effort. If a home, which is otherwise a passive asset (only increases in value due to market conditions) is improved by the parties putting on an addition, adding square footage, installing essential enhanced systems such as HVAC where there was none before, adding decks, renovating kitchens or baths, the value of the capital improvements, or enhanced appraised value received as a result of the capital improvements– could be shared. This turns on facts. For example, if the improvements were funded with another separate asset—inheritance funds, gifts from a parent, sale of another pre-marital asset, then the untitled spouse would not necessarily acquire an interest. However, if the improvements were funded by both or one of the parties’ marital earnings, or a joint mortgage, then yes, the untitled spouse would acquire an interest. 4. Adding Untitled Spouse’s Name to Deed. This is the most common way pre-marital homeowners either purposely or unwittingly, transfer interest a marital home, to the untitled spouse. The minute the titled spouse puts the non-titled spouse on the Deed, it is considered a “marital gift” fully subject to equitable distribution. The amount of the interest will again, turn on the facts: for example, how long has the home been in both names? What contributions or improvements were made to the house by each or both of the parties? For further information on your interest in a marital home, or to discuss your particular circumstances, please contact our office for a consultation. Puff & Cockerill Partner, Jeffrey V. Puff, envisions and brings into being a Bison statue at his alma mater, Bucknell University. 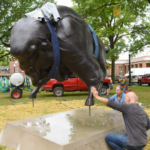 An article by Bucknell University and a YouTube video highlight the Bison statue’s arrival on Campus and discuss Jeffrey Puff’s leadership in spearheading the Class of 1975’s gift to the University. Who is Eligible for a Special Needs Trust? Commonly, a Special Needs Trust is a trust established by parents or loved-ones who have children who are covered under a disability and are receiving state or federal government benefits. The trust is specifically tailored to permit the parents to furnish some economic benefits to their children without disqualifying them from public assistance. Less frequently, but also applicable, a special needs trust may be used to provide for elderly persons who are disabled, such as a parent. For elderly persons, however, transfers of funds or assets into the trust cannot be made once the beneficiary reaches the age of 65. A special needs trust, also known as a supplemental needs trust, is a trust intended to allow a disabled individual to maintain eligibility for certain needs-based government benefits. Since government benefit programs are only intended to provide basic needs and critical items, i.e., food, shelter, clothing and medical care, a special needs trust provides supplemental items to improve the beneficiary’s quality of life. The supplemental or non-necessary items a special needs trust may provide include, birthday and holiday gifts, electronics, such as a computer, laptop or television, educational expenses or a vacation. Assets placed in a special needs trust are made available to provide for the disabled beneficiary’s special needs and to supplement, not supplant, public benefits. The availability of these supplemental assets can greatly impact and improve the disabled beneficiary’s quality of life.Government benefits programs provide basic necessities for disabled persons, however, these programs, such as Medicaid and Supplemental Security Income (“SSI”), are means-base tests and enforce financial limitations on personal eligibility. For instance, a person can only qualify for SSI’s assistance program if they have resources of less than $2,000 in their own name. Some assets are retainable that are not included in the $2,000 limit, such as, your car and life insurance policies with a face value of less than $1,500. A special needs trust, therefore, enables a disabled person to have assets and funds in trust for his benefit, which do not count towards SSI’s $2,000 cap. A properly drafted special needs trust must satisfy specific requirements imposed by federal and state law in order to exclude the contents of the trust from the beneficiary’s personal income calculation. The most important requirement, recognized at both the federal and state level, is that the state must receive all amounts remaining in the trust upon the death of the trust beneficiary up to an amount equal to the total medical assistance paid on behalf of the individual under a State plan. Additionally, the trust must specifically state that the trust is for the sole benefit of the beneficiary, must be irrevocable, and must state with specificity, that the trust’s purpose is to permit the use of trust assets to supplement, not supplant, impair or diminish, any benefits or assistance of any Federal, State or other governmental entity for which the beneficiary may otherwise be eligible or which the beneficiary may be receiving. These provisions are codified at the Federal level in 42 U.S.C. § 1396p(d)(4)(a) and at the State level in N.J.A.C. 10:71-4.11(g)(1). For more information regarding disability planning and special needs trusts, please feel free to contact an experienced trust attorney to help you and your family understand the benefits and details of a special needs trust or supplemental needs trust. An experienced attorney can help guide and explain the options that will effectuate your goals and objectives for disability planning.